Thanks to QVC for this recipe by Meredith Lawrence |Blue Jean Chef for QVC. 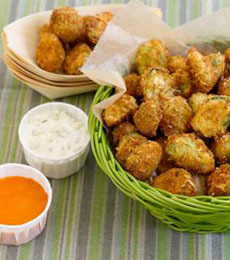 Even people who don’t like Brussels sprouts will enjoy these! Photo courtesy QVC. courtesy QVC. The recipe is below. 1. PREPARE the Buffalo hot sauce by combining the hot sauce and butter in a small bowl; set aside. 2. PREPARE the blue cheese dip: Combine all the ingredients in a small bowl and refrigerate until the Brussels sprouts are ready. 3. PREPARE the Brussels sprouts: Bring a saucepan of salted water to a boil. Blanch the halved Brussels sprouts in vigorously boiling water for 2 minutes. Strain and drain well, rolling around in a clean dish towel to remove as much of the moisture as possible. 4. FILL a straight-sided sauté pan with canola oil about 2-3 inches deep, and bring the temperature to 350°F. 5. PLACE the flour and eggs in two separate shallow dishes. In a third shallow dish, or a zipper-sealable plastic bag, combine the breadcrumbs, Parmesan cheese, salt, and pepper. Lightly dredge the Brussels sprouts in the flour, then dip them into the egg mixture. Coat with the breadcrumb mixture. 6. DEEP FRY the breaded Brussels sprouts in the oil until nicely browned. Remove from the pan and place on a rack or paper towel-lined plate. Allow the Brussels to cool slightly and serve immediately with the Buffalo Hot Sauce and Blue Cheese Dip. This recipe comes from QVC’s resident chef, David Venable. 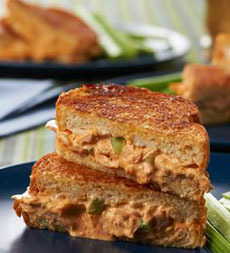 David’s tip: To make these appetizer-friendly, simply cut the sandwiches into bite-size pieces and place a toothpick into each square!. 1. SPREAD the butter evenly on four slices of bread and lay each slice, buttered-side down, on a work surface lined with parchment or wax paper. Set the remaining four slices aside. 2. WHIP the cream cheese in a mixing bowl until smooth and creamy, scraping the sides of the bowl once or twice. Add the Cheddar cheese and mix well; then fold in the blue cheese. Spread the mixture onto the plain side of each slice of bread. 3. COMBINE the chicken, mayonnaise, onion, celery, and Buffalo Wing sauce in a new mixing bowl; toss until the chicken is evenly coated. Spread this mixture on top of the prepared bread slices and top with the remaining four slices. 4. HEAT a large sauté pan or griddle over medium-low heat. Add the sandwiches and toast each side until golden brown, about 5-8 minutes. Serve.